Cris Cyborg stopped Lina Lansberg in the second round of their catchweight main event in Brasília after the Swede would eventually cave in to the barrage of strikes for a 17th career win. Also featuring on the UFC Fight Night 95 card was a thunderous stoppage from Roy Nelson against Bigfoot Silva, along with a handful of choke submissions and a first win for Renan Barão at his new division. 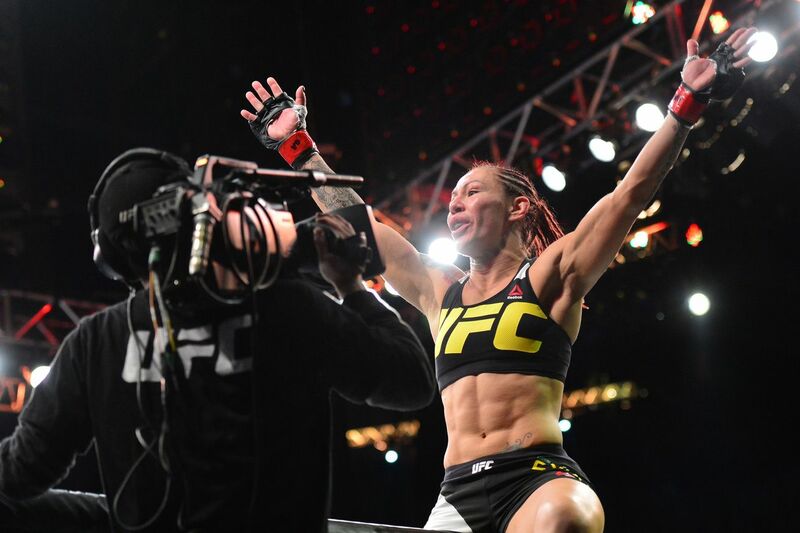 The night belonged, as was expected, to Cyborg - securing her legacy as arguably the greatest female mixed martial artist ever, enduring a terrifying weight cut to win in front of her compatriots. Highlighting the preliminary action was a shrewd submission from Erick Silva, who executed a canny step back to submit Luan Changas. With his opponent grabbing his wrist and going down to the canvas, Silva - who was in front of him - took a step back and immediately locked in the rear-naked choke to force the tap. 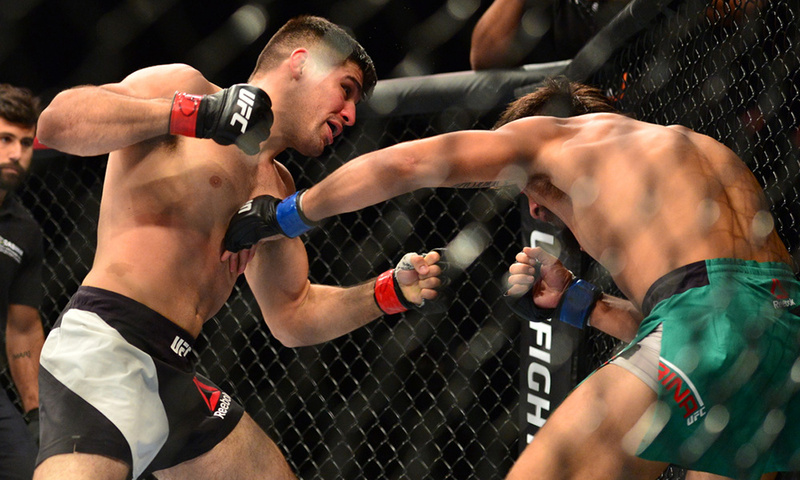 Vicente Luque also took some of the headlines as his lightning fast hands tore through Hector Urbina in around a minute. Godofredo Pepey gave the raucous Brazilian attendance a handful of reasons to go crazy once more, opening the main card with a submission win over Mike De La Torre in a short-lived yet wild throwdown. Both combatants had been stifled by one another's haymakers, throwing caution to the wind as they traded metal, but when the fight did hit the canvas, exhaustion would prevail. It was Pepey who managed to drag his opponent down and sink in a rear-naked choke, dispatching his American foe. Following that was another turf battle of the green and yellow flag and the red, white and blue - a common theme of the event in the capital of Brazil. This time round, though, there wouldn't be jubilation for the fans in attendance as Eric Spicely pulled off an eye-opening submission upset. Thiago Santos was handed a second straight loss, succumbing to a rear-naked choke after Spicely worked excellently to get the takedown. 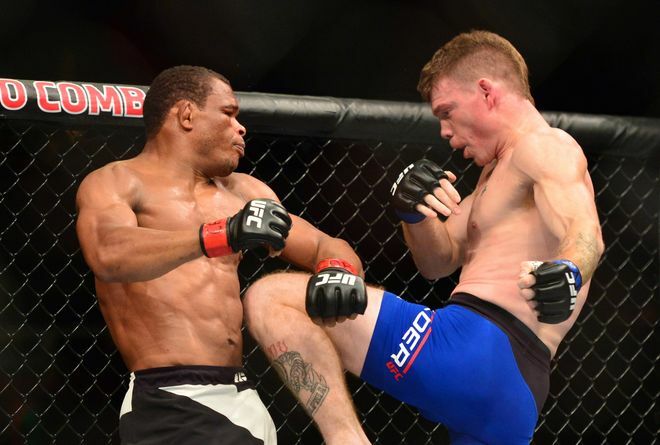 Francisco Trinaldo extended his win streak after a TKO due to doctor stoppage against Paul Felder. The Brazilian sliced up his opponent on the ground midway through the second round, and that cut would eventually take its toll. By the third round, "The Irish Dragon" was a bloody mess - and even though his desires to fight on were clear, the doctor wasn't having any of it, waving it off at 2:25. Roy Nelson registered another thunderous knockout as he dispatched Antonio "Bigfoot" Silva in the second round of their heavyweight tilt. The countryman Silva employed successful tactics early on, with the significantly larger frame allowing him to keep his opponent at distance and unleash kicks to the body and legs. "Big Country" did begin to close the gap and tempt some big overhand rights, although the improved defence of the South American helped him survive early. 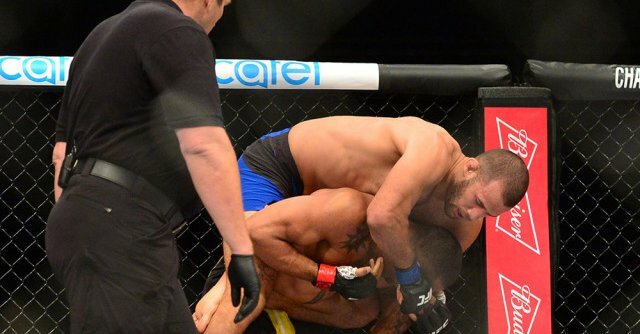 That would not continue however, as midway through the fight, the big shot would rock Silva, sending him down and a few strikes to follow, reluctantly by Nelson who argued the stoppage was late out considering the well-being of his opponent. Former Bantamweight kingpin Renan Barão got his first win at featherweight as he outworked Phillipe Nover over the course of three rounds. Showing some shades of his old self, the home fighter managed to land some quality kicks and do some work on the mat, but would tire later on unable to make as much of an influence. Nonetheless, it was enough to dob the job on the scorecards, taking the unanimous decision. In the main event, Cris Cyborg stopped Lina Lansberg in the second round with an annihilation against her European counterpart. The Swede did well to hang in there early on, with the Invicta champion rushing and applying pressure early on, looking for big shots as she backed up. Clinching and holding on - for dear life at times - was instrumental in Lansberg being able to stay in the contest, but Cyborg was simply too powerful. A big slam and some ground and pound in the first, and more of the same in the second would eventually lead to the fight being stopped - Lansberg bruised and bloodied, while the crowd erupted with a patriotic roar as Justino added further to her incredible legacy.